TEHRAN, Iran, April 17, 2013 (ENS) – The strongest earthquake to strike Iran in more than 50 years hit the border area between Iran and Pakistan Wednesday afternoon at 15:25 hours local time. The 7.8-magnitude earthquake has claimed the lives of an estimated 40 people and more than 180 others were injured. The number of dead is still unconfirmed. The ongoing collision of two enormous slabs of the Earth’s crust – the Arabian and Eurasian plates – caused the quake, seismologists say. Its epicenter was about 83 kilometers (52 miles) east of Khash, Iran, a city with a population of more than 70,000. Tremors were felt across Pakistan, India and the Gulf States, with people from New Delhi to Abu Dhabi reporting they felt the earth shake. 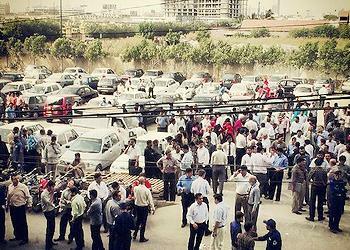 In Karachi, Pakistan, more than 500 kilometers to the south, office buildings were evacuated. The massive quake comes just eight days after a magnitude 6.3 earthquake in the Zagros Mountains shook southern Iran on April 9, killing 37 people and leaving 850 injured. 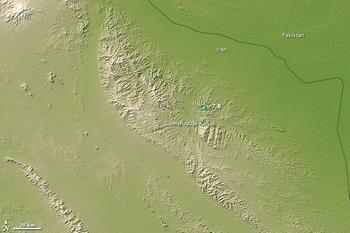 This quake occurred 96 kilometers (60 miles) from the port city of Bushehr, where Iran’s nuclear reactor is located. United Nations officials in Iran and Pakistan today offered assistance, if needed, to both countries. “The UN stands ready, willing and I dare say able to help, if requested,” Gary Lewis, UN resident coordinator and UN Development Programme representative in Iran, told journalists in New York via a telephone link. According to the Islamic Republic News Agency, IRNA, the cities of Khash and Saravan, both less than 150 kilometers from the epicenter in southeastern Iran, suffered no serious damage. Power and communications were disrupted in Sistan and Balochistan provinces. Across the border in western Pakistan, authorities report that as many as 34 people were killed and roughly 80 others injured in the Mashkel district of Balochistan province. In Pakistan, housing collapsed, leaving hundreds homeless in the town of Mashkel and nearby villages in Washuk district, Balochistan province. In the past hours, at least 10 camps have been established with 400 tents for survivors, Lewis said. Another strong quake with a magnitude of 5.6 shook the area Wednesday morning. If asked to assist, Lewis said his office would deploy UN quick action response teams as well as international search and rescue advisory teams. He said his office would work with the UN Office for Coordination of Humanitarian Affairs based in Geneva with a sub office in Cairo. Lewis said his office continues to work very closely with Iranian government authorities. “The message coming to us is that it’s being handled locally and the response is comprehensive,” he said. The International Atomic Energy Agency’s Incident and Emergency Centre contacted the Iran Nuclear Regulatory Authority, INRA, concerning the 7.8 magnitude earthquake in the southeast of the country. 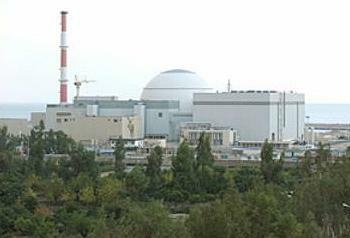 INRA informed the the UN agency that the April 16 earthquake caused no damage to the Bushehr Nuclear Power Plant or other nuclear facilities. The IAEA has made an offer of good offices to Iran, indicating it is ready to help the country obtain any assistance required to ensure the safety of radioactive sources such as medical equipment that may have been affected by the earthquake. The offer is in line with IAEA’s routine procedures after strong earthquakes that might affect nuclear or radiological safety. Iran’s nuclear agency said records show no fixed high-level radiation sources in the area of the earthquake. A number of villages have been assessed and assistance is being provided by the Iranian Red Crescent Society working under the overall coordination of the National Disaster Management Organization. Condolences came in from across the world. India’s Prime Minister Dr. Manmohan Singh sent condolences to President Zardari of Pakistan and to President Mahmoud Ahmadinejad of Iran. The Iranian president was not in the country but was on a visit to the West African nation of Niger. The earthquake highlights the apathy of the governments of Pakistan and Iran towards the plight of the Baloch people, says Washington, DC-based Baloch writer Ahmar Khan. Balochistan is the region where Pakistan carried out its nuclear tests in May 1998. Khan cites locals from the region as saying there are indications that Pakistan may be planning more nuclear tests in the region.